This wasn’t common earlier but in past few years, I have seen a lot of cases where small children are losing hair which has become a major concern for parents! It is not common during childhood but anything is possible! Check out for causes of hair loss! – Some kids have habit of pulling their hair like thumb sucking. 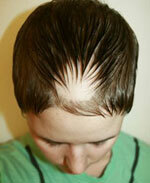 – It usually stops after 3 years of age but this sometimes leads to hair loss. – The best way to deal with it is keeping your child’s hair short! – Sometimes redness can also be the sign of this infection. – If your kids are tying ponytails or hair very tightly then hair loss can happen. – Some infants loose hair because of continuous rubbing against the crib to get rid of this, avoid changing sides frequently. – In this your child’s immune system is attacking against the hair follicles. – Some steroidal treatment is done but the hair comes back too! – Tension and extreme stress leads to hair pulling. So you have to know how to overcome from depression and stress.